On LinkedIn, e-commerce giant net-a-porter.com had posted the job of my dreams and it was staring at me intently, like a child who wasn’t getting enough attention. Deep down, I knew that job could be mine, but how? Everything seemed to me, to be against me. I’d been a stay at home mom for several years and my self confidence was low. Even though I was a trained graphic designer who had built successful e-commerce applications in the past. When I saw jobs posted on LinkedIn that I knew I could do, negative thoughts would rise up inside me like a wave. They followed me like a bloodhound on a new scent. What I’ve learned since then sounds counterintuitive, but getting the most desirable jobs and clients everyone wants is not about having more confidence, self-belief or experience – it’s about aligning your skills to the companies hiring needs. 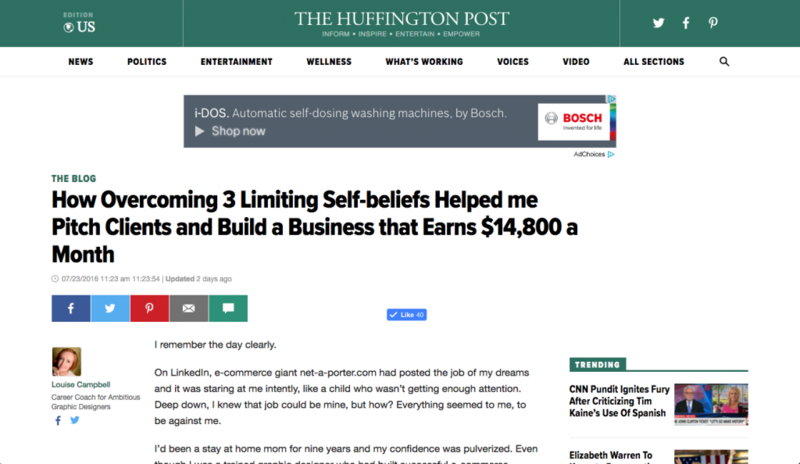 So if you want to banish limiting self-beliefs for good, and get the jobs and clients everyone wants, but don’t know how to ask for, read on. Feelings of inadequacy used to sweep over me like a massive wave at the mere mention of the word “interview”. Starting in the pit of my stomach and radiating outwards. Adrenaline pumping, my head swirling with fantasies of how perfect my life would be, if all I had to would be fill out that application form, hit send and voila! The job would be mine. Your level of job application research and preparation deeply matters. The alignment of your skills and cover letter to job description is key to getting an interview. Who you know in the company helps, but it’s not always 100% necessary. An actual email sent by a client of mine who wanted advice on what she’d done wrong because she didn’t get invited to interview. When you send an email like that it makes the hiring manager think you don’t care, they feel unloved and your application gets moved to the bottom of the pile. An example of how to do this the right way would be to get a personal email introduction to a potential boss through a mutual colleague or warm connection – this approach will instantly get you elevated to ‘potential candidate’ especially if the employer trusts the recommender’s judgement. It’s Petra here<――[your connector’s name], we worked together on the X project. I heard your hiring and I want to introduce you to a designer friend of mine, Sherilyn. She is a talented graphic designer and always goes above and beyond. I’ve cc’ed Sherilyn’s details. Sherilyn, take it away! Have the good fortune to chat with the potential employer to see if you’re a good fit for the job, before you apply. Your level of preparation will make you stand out because did you know? 98% of applicants don’t ever go that extra mile of detail. And that extra mile will make you shine, like an enlightened being in a sea of mediocracy. By taking incremental steps to find out what your potential employer wants is how you can start to melt limiting beliefs away. Deep down, your instinct is telling you, you can do the job, but when you read your CV and the job description together – they seem worlds apart. That’s because you need to align your skills to match the job description. Each job you apply for has to have your customised CV to go with it. Not a generic CV that will end up in the dungeon of doom. A CV sent to me by a client of mine – who wanted advice on what she’d done wrong, because she didn’t get invited to interview. When you do that, the employer thinks yours are an unlikely fit. They want to hire the best fit, and you’re not showing them how you can be a great fit – they were hoping it would be you. Hiring takes your potential boss away from his job, now they have to go back and look through another pile of CVs. Here’s a copy of my CV. Feel free to use the structure for your submissions. When you align the language used in job description with your CV – magic starts to happen. Suddenly your CV matches the job description. Also, see how it fits nicely on one page. There’s a reason for that. No one wants to sift through a 10-page monolog of your life’s work. Each succulent bullet point is dripping with skills that match the job description you’re applying for. Each job is backed up with the success your work achieved, to stand out and increase your hire-ability barometer. But remember everything pivots around your future employers hiring needs. “The real magic is in doing your homework before you ever set foot in the interview room because 80% of the work happens before you ever sit down for a meeting. Now, if the interviewee is using the Briefcase Technique, that’s the exact moment when they pull out a pitch proposal document with things they’ve found in my business that they can improve and exactly how to do it. As the business owner or hiring manager, it’s the most compelling menu they’ve ever received. It’s a list of problems I already know about, and they’ve identified them from the outside. Then, a list of potential solutions. By doing this you’ve already singled yourself out from 99% of other applicants. You can counteract your negative beliefs by taking action. Positive action is the antidote to limiting thoughts. So if you’re afraid, regularly check what you’re telling yourself, you don’t have to be at the mercy of destructive thought patterns anymore. Let me know how my suggestions have helped you. I’d love to hear how in the comments below. For more by Louise Campbell, click here. Learn how to get your first design client – even if you don’t know how click here.